For blog posts prior to April 2018, visit our old site. You might also enjoy the ROS blog and the Gazebo blog. 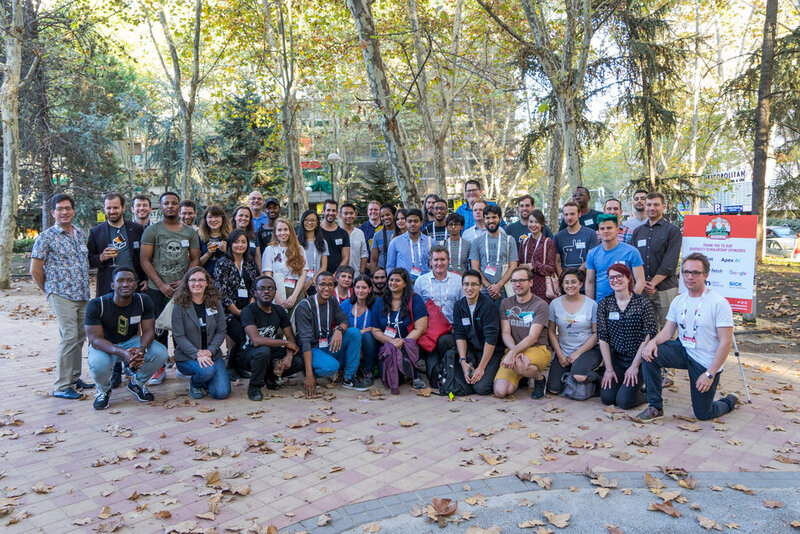 ROSCon 2018 marked the third year of the conference’s diversity program, which is designed to enable participation in ROSCon by those typically underrepresented in the tech community. Thanks to the support of the program’s sponsors Amazon, Apex.ai, Erle Robotics, Fetch Robotics, Google, Locus, Open Robotics, and SICK, we were joined at the conference by close to 30 roboticists from around the world who otherwise wouldn’t have made it to Madrid. Our hope is that, like all attendees of ROSCon, the scholarship recipients will return home after the event to share the knowledge and networks that they’ve acquired in order to strengthen their local ROS communities. 2018 ROSCon Diversity Committee and Scholarship Recipients. ROSCon has been an incredible experience. It is really encouraging to see that everyone in the robotics community is really welcoming and willing to share their expertise. I learned a lot and I met incredible people. This experience inspired and motivated me to contribute more to the robotics community and make a positive impact. This would not be possible without the generous support from the scholarship sponsors. Your generosity truly makes a difference. Thank you! My attendance at ROSCon 2018 has given me useful insight into the breath of the user base behind ROS, and close contact with the community that make ROS work. This access has deepened my interest in ROS and the world of robotics and I gained useful insight on how to progress my research into ROS and the application of robotics in my profession as an architect while talking with people I met at the conference who were all friendly and eager to offer information and tips. Along with all the great people from all over the world, I met 3 other Nigerians involved in robotics and of the four of us, I was the only one currently resident in Nigeria. With robotics being such a rare field in Nigeria, it revealed the potential for the diversity scholarship to draw out globally dispersed ROS users from the same region and connect them at an international platform. This creates more opportunities for future collaboration and knowledge transfer. The scholarship program continues to grow each year, and so outside of the standard conference schedule we also host a reception for the diversity program prior to the event. This provides an opportunity for scholarship recipients to connect with the sponsors of the program that have helped fund their attendance. 2018 ROSCon Diversity Sponsors, Diversity Committee, Organizing Committee and Scholarship Recipients.